Below you will find links to each of four quarterly reports as well as our 2019 forward-looking statement from our Executive Director and board of directors. As Lowcountry Legal Volunteers stands poised to celebrate its 20th Anniversary of service to those among us who cannot afford equal access to justice, a right we all share, a right embedded in our Constitution, it makes sense for us to remain highly focused on the challenges ahead. From how we better serve those in need to how we expand and provide access to our services we are focused on our future. 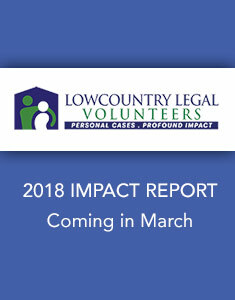 Knowing our organization’s history as one of South Carolina’s longest standing pro-bono groups places us on the perfect trajectory for our next 20 years and the work that we will do to help restore balance and stability to families and strengthen the communities we serve here in the Lowcountry. Our impact has been and will continue to be well documented and visible to all who pass through our doors. The strongest evidence of what is possible when we care for one another and work together to improve the human condition is evident in the lives of the families we help lift from peril to create hope and a path forward.